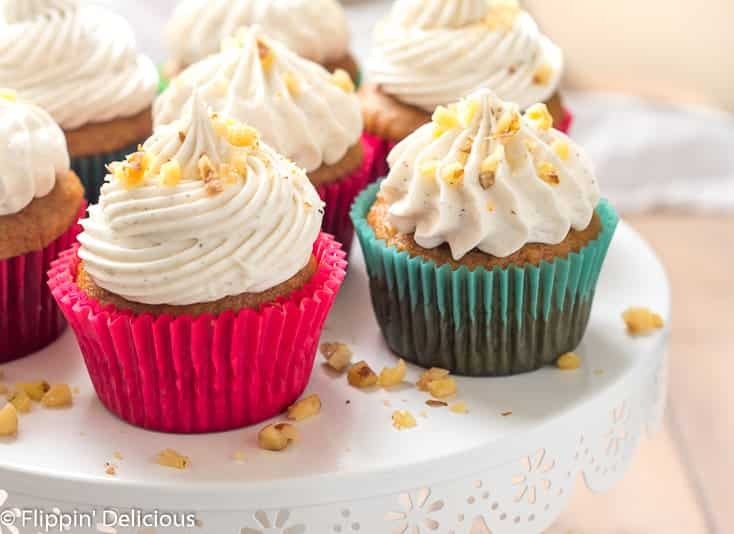 Gluten Free Carrot Cake Cupcakes- Tender, lightly sweet, studded with walnuts, and (dare I say) moist, these cupcakes are perfect for the carrot cake lover in your life. 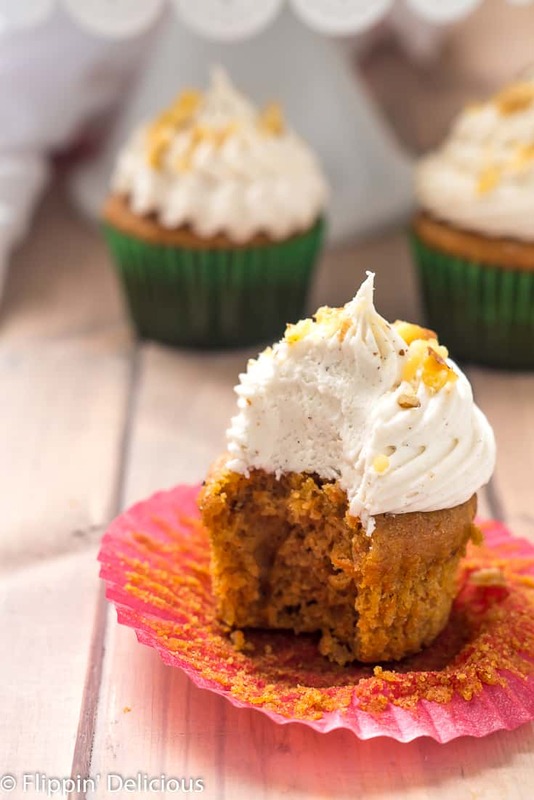 Topped with a fluffy whipped cream cheese frosting, each bite is perfection. I have always been a carrot cake fan. 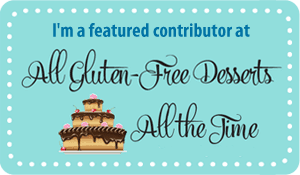 And a gluten free carrot cupcake fan. I get it from my mom. 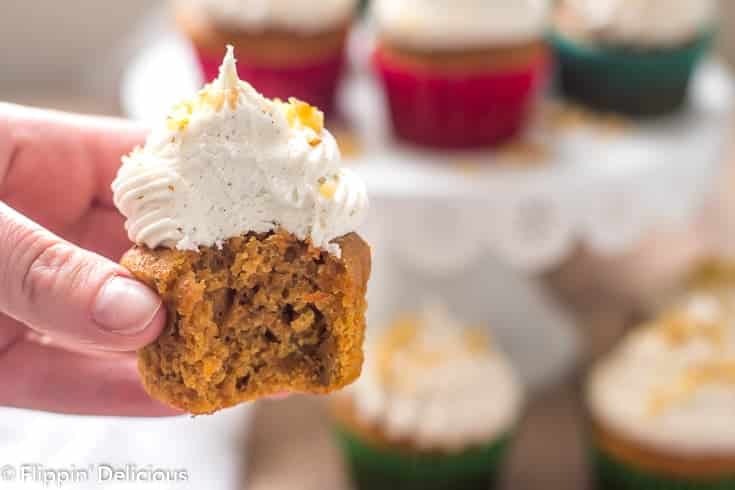 I love the sweet hint of cinnamon, the sweetness of the carrots, and of course the rich and fluffy cream cheese frosting. Growing up we never had nuts in our carrot cake because my dad has a tree nut allergy. As an adult, I have grown to love the slight crunch that walnuts or pecans bring to a slice of gluten free carrot cake. 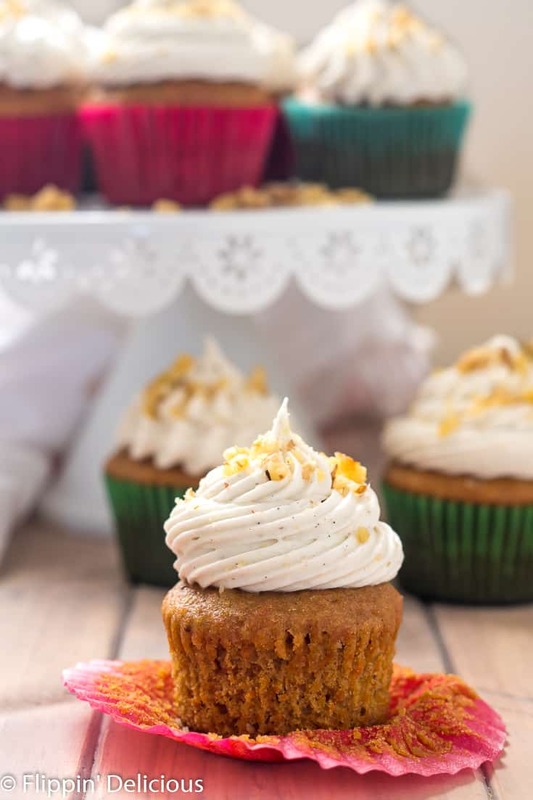 These gluten free carrot cupcakes are a special treat I get to share with my mom, since she is one of the few people in my family who also loves carrot cake, and carrot cake with nuts. 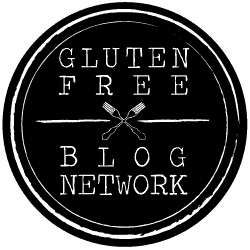 How is this recipe different from my gluten free carrot cake recipe? 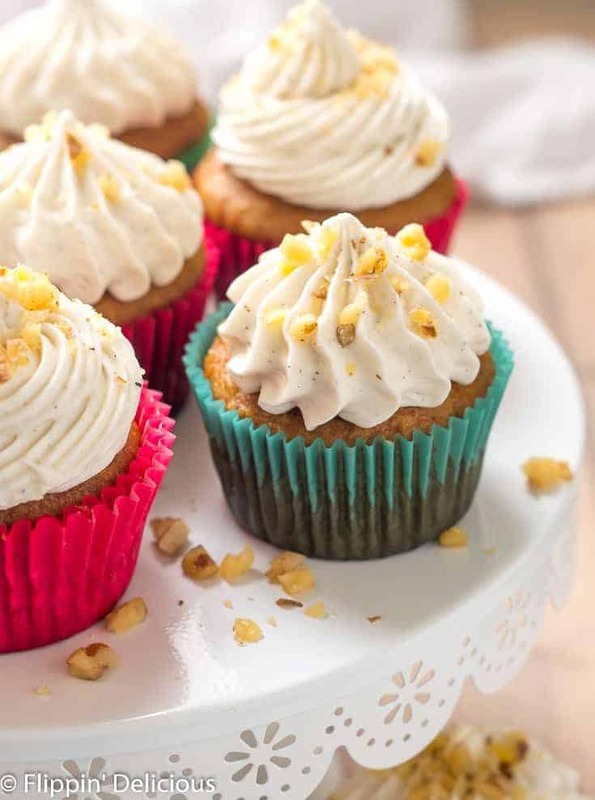 I adapted these gluten free carrot cake cupcakes from my gluten free carrot cake recipe. I decided to cut back on the sugar and oil a bit and added some apple sauce to keep the cupcakes moist with the perfect bite. The cupcakes were perfectly tender and moist, I didn’t miss the extra sugar or oil! I actually liked the texture even more than my original recipe. For the frosting, I used a half batch of my easy cream cheese frosting. I added a bunch of vanilla paste to it, which left pretty little vanilla bean specks in it. Of course, you can use vanilla extract like the recipe calls for. I just love the way the vanilla bean specks look, though. To add nuts, or not to add nuts? For a few reasons, I sprinkled the frosted gluten free carrot cupcakes with some finely chopped walnuts. First, they look so pretty! Second, I wanted to give everyone a hint that there were nuts inside. So, if you don’t want to take my word for it, take my mom’s. 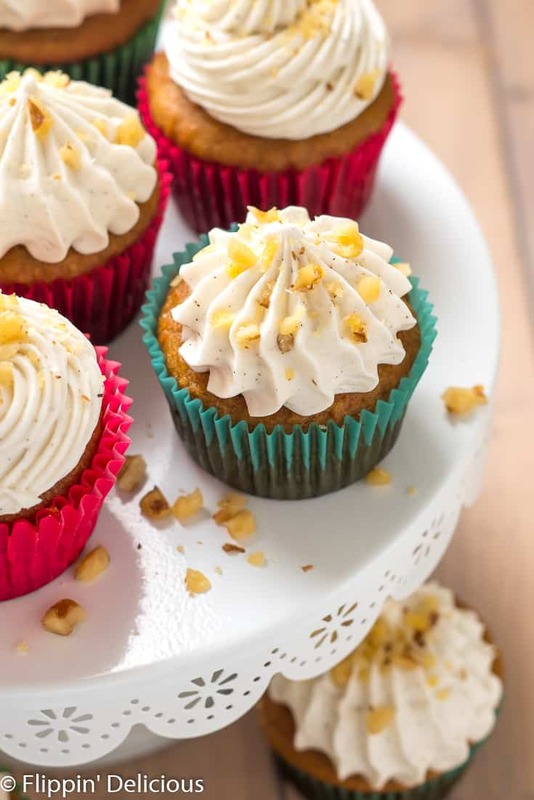 These gluten free carrot cupcakes are basically da bomb diggity! 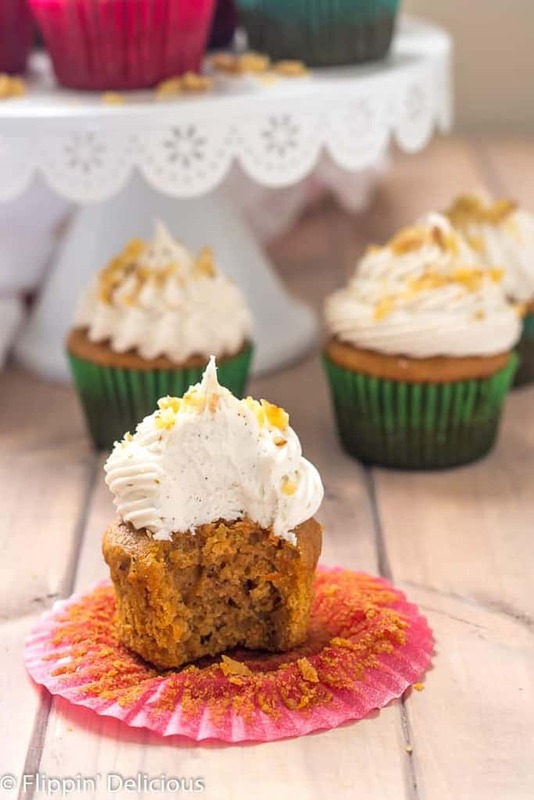 If you are looking for a healthier, more breakfast appropriate gluten free carrot cake muffin, try my gluten free carrot zucchini muffins with whipped cream cheese. I lived off of them when I was pregnant! Let’s bake some gluten free carrot cake cupcakes! Preheat the oven to 350°f and line a cupcake pan with paper liners (or lightly grease each cup). In a large mixing bowl or stand mixer, beat the apple sauce, brown sugar, oil, eggs, vanilla extract, and carrots until the sugar is completely dissolved. In a separate bowl, whisk together the gluten free flour, baking powder, baking soda, cinnamon, salt, and xanthan gum. Add half the dry ingredients to the wet ingredients, mix until combined. To the mixing bowl, add the remaining dry ingredients and mix until combined. Fill each cupcake liner about 3/4 full of batter. Bake for 22-24 minutes, or until a toothpick inserted near the center comes out clean and the cupcake springs back when lightly touched. 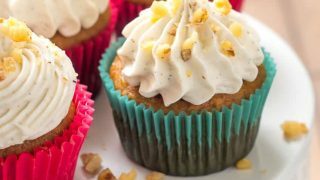 Cool completely, frost with a 1/2 recipe of easy cream cheese frosting and sprinkle with finely chopped nuts, if desired.